ZIMBABWE – President Robert Mugabe has once again leapt to the defence of his wife, who is facing an internal revolt for trying to silence Vice-President Emmerson Mnangagwa’s backers in the bitter Zanu PF war to succeed the 92-year-old leader. Mugabe yesterday spoke strongly against Zanu PF officials and followers that denigrate First Lady Grace Mugabe at his birthday celebrations held at the Great Zimbabwe ruins in Masvingo, where he also sang G40 faction kingpins’ praises. In a pointed attack directed at the Mnangagwa faction, Mugabe said those targeting youth leader Kudzayi Chipanga for challenging war veterans were wrong. Chipanga has of late been a target of vicious attacks by the State-controlled media, which has been fighting in Mnangagwa’s corner against Grace’s G40. Mugabe also seemed to be backing under-fire political commissar Saviour Kasukuwere who stands accused of targeting Mnangagwa’s supporters through suspensions. Kasukuwere suspended three Zanu PF provincial chairpersons that allegedly stopped party supporters from attending a controversial rally in Harare where Mnangagwa was first put to the sword by the First Lady’s supporters early this month. Mugabe warned “misguided and unruly youths” who were going to extremes in denigrating party leaders, including his wife. He said the party would not hesitate to deal with them. The veteran ruler said it was unheard of in our culture for youths to attack their elders, worse still, the wife of the head of state. “We hear a lot of misguided party members attacking my wife and that is very rude. These people do not respect us,” Mugabe said. The attack could have been directed at the Mnangagwa faction, whose members have been taking turns to savage Grace after her Chiweshe rally, where she attacked war veterans and Mnangagwa for allegedly fanning factionalism. 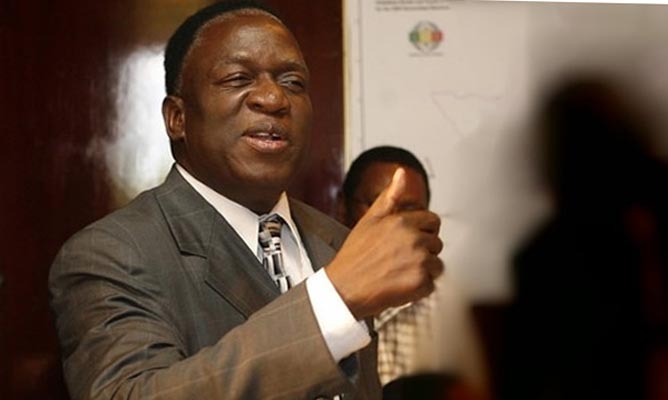 Former freedom fighters sympathetic to Mnangagwa led by War Veterans minister Christopher Mutsvangwa were forced to abandon a meeting just over a week ago allegedly to protest against Grace’s attack on the VP at her Chiweshe rally. After the Chiweshe rally, Kasukuwere suspended provincial chairpersons for Masvingo (Ezra Chadzamira), Midlands (Kizito Chivamba) and Biggie Matiza (Mashonaland East) for allegedly stopping supporters from attending a hastily arranged rally. The abortive rally was followed by a media briefing by pro-Mnangagwa youths calling themselves Save Zimbabwe, led by former Mashonaland Central youth chair Godfrey Tsenengamu. The youths attacked Grace warning they would fight her if she continued attacking Mnangagwa. Another group of war veterans led by Francis Zimuto, who calls himself Black Jesus also dressed down Grace, advising her to stay at home and cook for Mugabe, while also telling her they only considered her as their step mother, and not First Lady. Mugabe responded quickly by apologising to the war veterans, but attacked Mutsvangwa, saying he deserved the tear gas for leading the ex-freedom fighters in an illegal meeting which he knew nothing about. The attack on Grace forced Chipanga to rally youths and prepare for a war against the former combatants he accused of disrespecting Mugabe. However, the war veterans and youths aligned to Mnangagwa vowed to fight Chipanga. But Mugabe yesterday said attacking his wife was a reflection of blatant disregard and disrespect of him as president of the country. He described youth who attacked their elders as uncouth and claimed they were under the influence of dagga. Mugabe said it was also a disgrace to observe that some of the youths were being paid to peddle falsehoods to foreign media about his wife. Mugabe also took a swipe at party heavy weights taking advantage of the challenges affecting the youths, such as unemployment to abuse them in their pursuit of selfish interests. “We cannot have such misguided youths, they have to be disciplined and respectively. “Even senior party members, we must stop to work behind the scenes using the youths to play our games that is not the way to get to power. Factionalism is coming from the so called ‘party gurus,’ who abuse the youths,” Mugabe charged. Praising his “loving wife,” Mugabe immediately cajoled the ex-freedom fighters. “I am also a war veteran so can I go against the war veterans? Yes we fought in the liberation but then we must not reject advice from our fellow comrades,” he said. He defended Kasukuwere, who war vets have been demanding his resignation alongside Higher Education minister Jonathan Moyo over the suspension of pro-Mnangagwa provincial chairpersons. “We also hear some people attacking Kasukuwere over the suspension of party members,” he said. Mugabe said Chipanga was a hardworking cadre. He said he was quoted out of context when he attacked the war veterans. Mugabe described Chipanga as a principled youth leader who wanted unity of purpose in the party. He warned that while war veterans were a vital cog in Zanu PF, they should not antagonise the youths. Acting Masvingo provincial chairperson Amasi Nenjana told Mugabe he was against youths and party officials who attacked the First Lady in apparent attack to the Mnangagwa faction. He said Masvingo was behind the First Family, despite the fractious province being heavily divided over Grace with the Chadzamira executive being sympathetic to Mnangagwa. Zanu PF youth commissar Innocent Hamandishe also condemned youths who attacked Grace, calling for discipline in the party. Mugabe also praised the party’s secretary for youth affairs Pupurai Togarepi, for working hard to ensure the success of the birthday bash. Earlier on, Togarepi, who is believed to be a Mnangagwa ally, castigated the use of social media to attack other party members, threatening stern action against such members, a point buttressed by Mugabe during his address.